Army Reserve Capt. 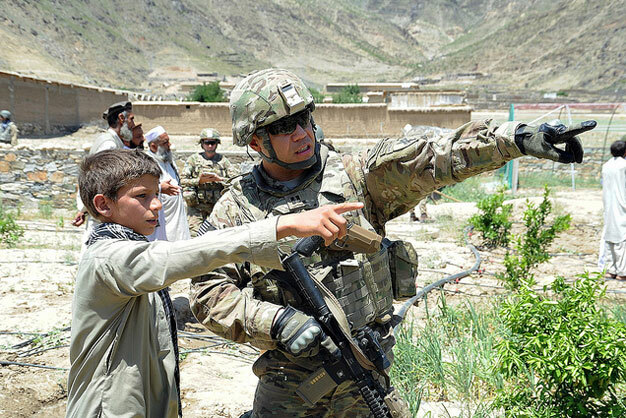 Herm Blacaflor speaks to a local teenager about the location of his school during a visit to the Central Kunar Demo Farm. The Provincial Reconstruction Team Kunar agricultural section assists the demo farm to show the farmers and other locals nearby more effective ways to cultivate crops. The PRT is made up of Navy, Army, Air Force and civilians who work alongside local government officials to reconnect the people of Afghanistan with their government. US Air Force photo by Tech Sgt Christopher Marasky.